How to make front page news. A South Ealing hairdressers has got more than it bargained for this week with its latest marketing efforts. The salon made front page news in the Evening Standard on Tuesday and has been featured on TV, radio and in the national press and all from a poster in the shop window! 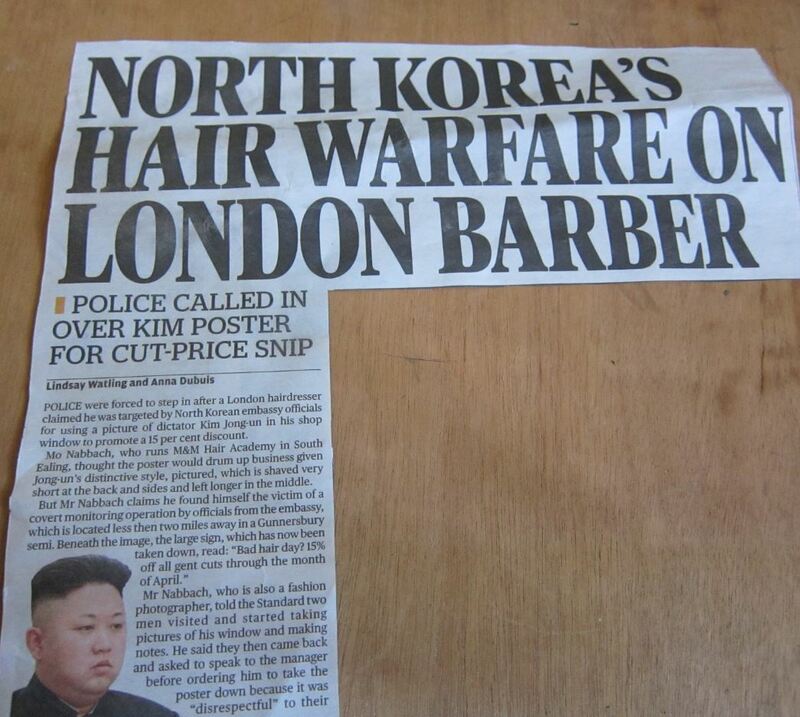 An Ealing hairdressers makes front page news in the Evening Standard this week. 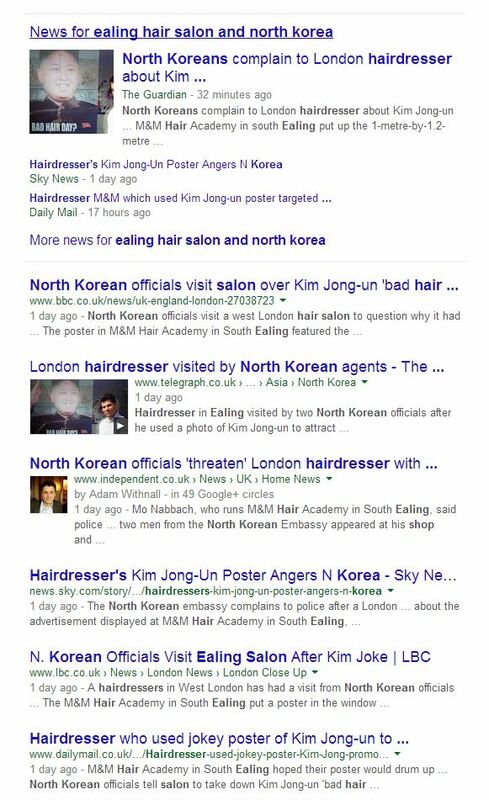 The poster linked bad hair days to a photo of North Korean leader Kim Jong-un and offered a 15% discount on men’s haircuts during April. It soon attracted the attention of officials from the North Korean embassy which is less than two miles away from the salon. The officials felt that the poster was disrespectful to their leader and insisted that it be taken down. I doubt if the embassy staff expected the story to make headline news! A quick Google search shows just some of the many stories generated in the national media. I’ve lived in Ealing for 30 years and wasn’t familiar with M&M Hair Academy. I am now! This just goes to prove the value of news coverage. Now I’m not suggesting you seek the wrath of the North Koreans, that story has been done, but I am suggesting you look for stories of your own. Journalists need good stories. As pressure on budgets mounts much of the media is shedding jobs but papers and programmes still have to be filled. The journalists that remain have to produce more stories in less time so they need all the help they can get. No media is going to feature a story which is a blatant sales pitch but they might find space for a human interest story. Have you done someone a favour? Do you have a member of staff who has gained a qualification, completed long service or received an award? Have you raised money for charity, sponsored a sports team or an event or donated a prize? Is your business celebrating an anniversary or landing a significant contract? Do you have a customer who has worn one of your outfits to a great occasion or gone on to bigger and better things as a result of your help? All of these are worth sharing with your local media, write a news release, call your local reporter or fill in the form on the media’s website. If you can’t think of a story of your own then go to Twitter and type #journorequest into the search bar and you will find lots of pleas from journalists looking for help with stories. As I write there are requests for help from tech start ups, from beauty salons, from brides, from comic book experts, from teachers and more. They’ve all been posted this afternoon and today is typical. So my challenge to you today is to go and find your story and get it featured in at least one local medium. Then share your story here. Go on, what are you waiting for? This entry was posted in Marketing, Public relations, Small business advice and tagged Kim Jong-un, M&M Hair Academy, news releases, news stories, North Korea by glendashawley. Bookmark the permalink.